Turn heads each and every time you hit the town when you put on your very own CZ Cross Slide Necklace in Sterling Silver. This beautiful necklace set features stunning Cubic Zirconia stones, 37 of them to be exact, along with high quality sterling silver. 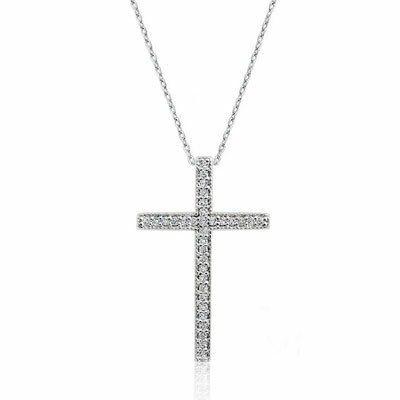 The beautiful cross pendant design is simple and sophisticated, balancing the flare of CZ stones and the simple style that fits any look.The CZ Cross Slide Necklace in Sterling Silver sparkles in the light thanks to the small 1mm stones that make up the cross. The 18 inch sterling silver necklace comes with the set and features an easy close and easy open clasp set up. The sterling silver is hypo-allergenic and safe, and the chain and pendant are sturdy, making this set perfect for long time or daily wear. Whether you are looking for something to wear every day or something for special occasions, this is the necklace for you! We guarantee our CZ Cross Slide Necklace in Sterling Silver to be high quality, authentic jewelry, as described above.